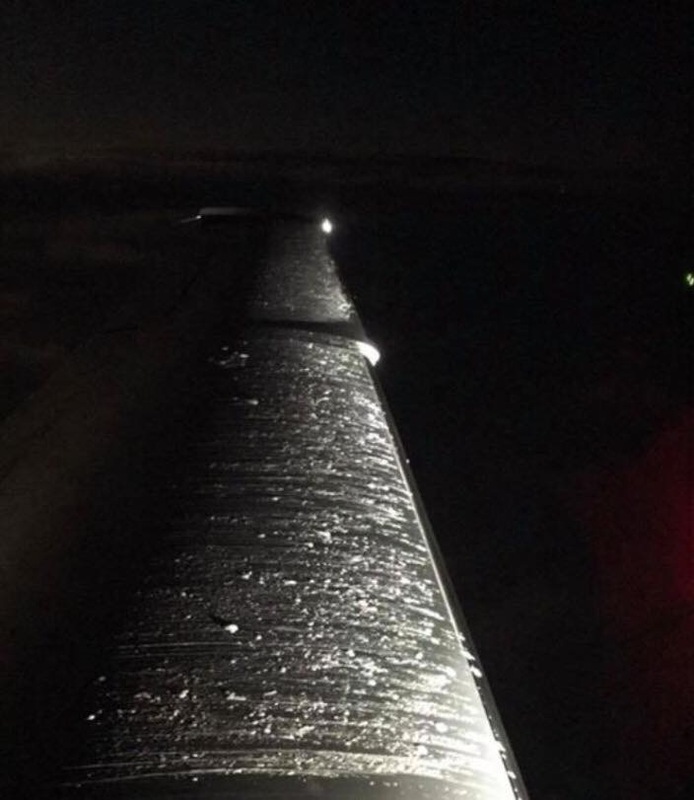 When flying during the winter, is there anything I can do to increase my margin of safety, such as anti-icing fluid? I've heard of people spraying their aircraft with propylene glycol, but am curious to know if this will do anything to prevent ice after takeoff, especially without a thickener. There are many things you can do to mitigate the risk of icing, but most involve prevention via avoidance of icing conditions. For example, getting a good weather brief, knowing where the freezing level is, staying away from visible moisture, and finally, recognition and taking evasive action. Pre-flight deicing liquids are not intended to prevent ice accumulation in flight. As you noted, they will just blow off in the slip stream. Anti-icing fluids such as TKS are very effective, but the aircraft must be equipped with a system to properly disperse it to be certified for flight into known icing conditions. If you are not instrument rated it gets easier, because if you stay out of clouds you won’t ice up. But if you want to fly IFR in the winter, (or any time you could be IFR in the temperature zone where ice could form) your best method of increasing the safety margin is to arm yourself with knowledge, practice operational risk management, and exercise sound judgment to keep yourself out of icing. Generally light GA aircraft have limited anti ice system, usually limited to just pitot heat. Some newer aircraft have been certified for flight into known icing (FIKI) and make use of chemical deicing methods like TKS “weeping wings” or electrically heated systems like the Kelly ThermaWing. I will caution you that, even if your aircraft is FIKI certified, this is by no means an encouragement to actively enter or remain in icing conditions. Rather it is just an additional layer of protection to allow a pilot to escape icing conditions. GA planes are not transport category machines and do not offer that same level of ice protection that transport catergoy aircraft do. Also note that these system do have their limits. Operate outside of them and anti icing systems can be pretty hazardous, as this photo from an acquaintence of mine shows after having used a TKS system in an SR-22 in temps below that recommended for the system. Even more tragic was this case from New Jersey where a pilot flew a FIKI certified TBM-850 into severe icing conditions and it cost him his life. Again the systems can help if you get into a pinch and need additional time to escape, but the best course of action is to avoid icing conditions in the first place by doing a proper Preflight, setting personal minimums and strictly adhering to them.........and knowing when to say when. In the end, for a VFR pilot, if there is any chance of running into rain in winter, it's all about the freezing level. The criteria for use of heat anti-icing on jets for departure is visible moisture (which can be rain, snow or mist/cloud) below +5C OAT. The pressure drop over the wings causes a small temperature reduction that eats into this margin, so it's actually less than +5C on top of the wings when you are flying in +5C free stream air, especially at lower speeds. Due to the extreme danger of an icing encounter, this margin is probably not really enough for VFR and it would be a good idea to use +10C/5000 ft below freezing level as a planning minimum if there is any risk of a rain encounter on a trip. You would apply this safety margin such that when you check the weather and there is any chance of an encounter with rain, you want to make sure the freezing level is 5000 ft above your planned minimum cruising level to give you at least that +10C safety margin for the entire route. If you can't cruise at least 5000 ft below the freezing level, you have to be sure the air will be free of any visible moisture on your route. A brief encounter with snow is not too bad, from an accumulation risk perspective, if the temperature is well below freezing and the snow is very light, but still best to avoid it because the effect on visibility is severe in anything more than very light snow and it can change from light to not so light pretty fast and it's quite frightening. So stay away from snow. Anti-icing fluid (a different mix of the same chemicals used for de-icing) applied to airliners is only effective at keeping ice from forming on the planes while taxiing and waiting to take off. All that fluid will be blown off the plane by the time it rotates, though. Once in the air, a plane must rely solely on its onboard de-/anti-icing systems until landing. If a plane doesn't have the latter, then the former won't do anything of value. If you can't stay out of icing conditions, then stay on the ground until they pass. Period. Not the answer you're looking for? Browse other questions tagged general-aviation icing anti-ice or ask your own question. What are the different kinds of de-ice fluid? What common forms of deice and anti-ice exist and what future alternatives are being researched? What make and model are these two small propeller planes? Could someone please explain why the A320 doesn’t have an anti ice system for its vertical and horizontal stabilisers? Are there specific names for airport vehicles used for de-icing?